Bio: Ester de Jong is president of TESOL International Association (2017-2018). 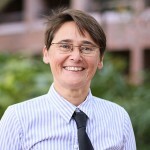 She is also a professor in ESOL/bilingual education and the director of the School of Teaching and Learning at the University of Florida, where she teaches courses in bilingual and bicultural education and in curriculum, methods, and assessment for English learners. Her research focuses on two-way bilingual education, language-in-education policy, and mainstream teacher preparation for bilingual students. December 1, 2017: TESOL President’s Blog: TESOL Connects!